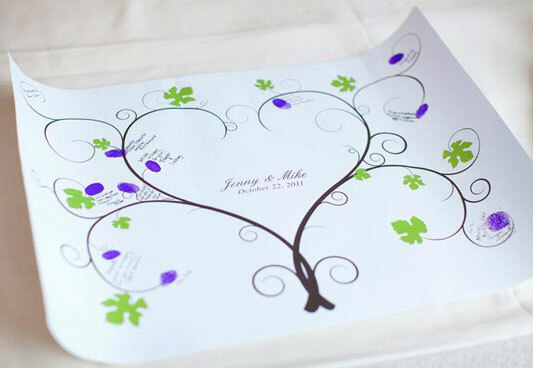 A thumbprint or fingerprint tree is an alternative to your standard wedding guest book, and can even be used at christenings, showers, birthdays and anniversarys - remember paper is the traditional gift for a first anniversary. 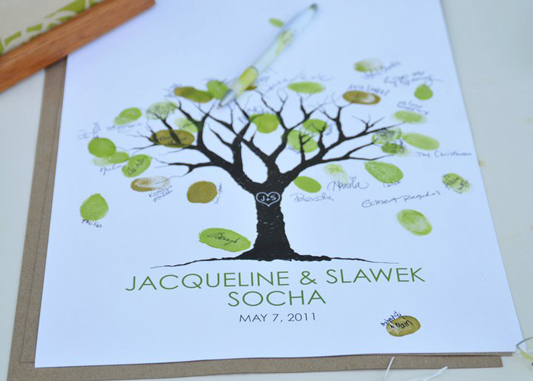 The guest book in this case is an image of a bare tree which guests place their fingerprint on to represent a leaf. The guests can then sign their name below the print as a symbol of their attendance. 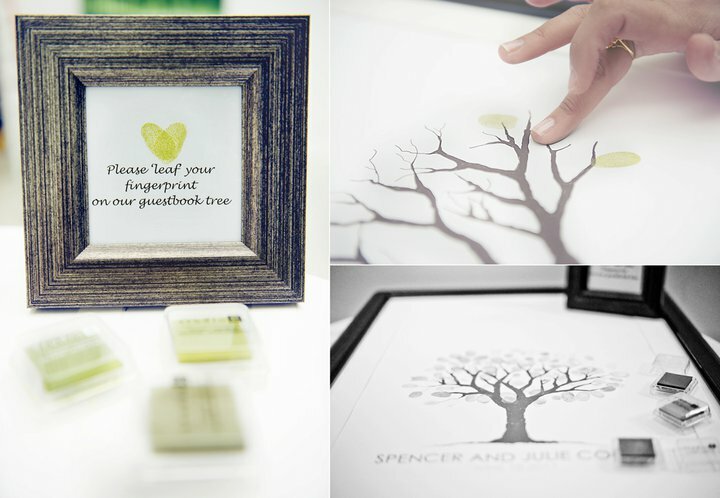 After the wedding a framed fingerprint tree makes a beautiful keepsake to display in your home and cherish forever. To leave their print guests just press their finger onto a coloured ink pad then onto your tree. There are plenty of cute ink pads available from art shops and craft stores, our favourite is momento dew drop ink. It is acid free, water based and fast drying and comes is a cute little leave droplet shape. You can find moment dew drop inks here. It can be nice to have a few different shades for guests to choose from too. Other brands to consider color box, you can find these at your local art or craft shops and online. Fine art and scrapbooking pens are best for guests to sign with, try Faber Castell and Memory Marker. No, just have a pack of wet wipes and a towel handy so guests can quickly clean up after and be more inclined to participate. A bin or basket nearby is good for the used wipes too. If you're still worried you can get leaf shaped stamp pads instead and just ask guest to use the stamp then sign. Or consider a signature only tree. For paper we recommend using a fairly thick stock, art or matte is good rather than high gloss. Anywhere from 180-350gsm, but the thicker the less chance there is of the paper crumpling when ink is put onto it. We have had many customers successfully print onto canvas too, it is a more expensive printing option, but it will be ready to hang. Remember to choose 'not' to wrap the image around the edges of the canvas, or it will zoom in on the print giving you less room for your fingerprints.You can use an online PDF to JPG converter if your printer only accepts JPGs, such as convert-my-image.com/PdfToJpg or pdf2jpg.net selecting 300dpi. How much will it cost to print? But of course the small sizes can just be printed at home on a sheet of nice thick paper. Ink and pens are only a couple of dollars. In Australia try: Officeworks, Kwick Kopy, WorldWide Print, Snap. In the US try: Go Print, Staples, Kinkos. Look for colour poster and large format printing options. Turn around time for a design on 'i do' it yourself is only 24-72hrs, more often than not you can get it the same day! Your local printer will be able to whip the final thing up in a few days, some will even offer a same day service, so it's great for that last minute wedding idea. Of course it doesn't have to be a tree, there are guest book peacocks, grape vines, balloons and more! Test it first. Get a sample of the paper you plan to print on and test it with your ink. Make sure you like the effect before getting your tree printed, and check it after an hour or two to make sure the ink has dried properly on the paper. If you don't like the look or the ink and paper react funny, just change your paper stock or even try a different brand of ink. Use quality paper. Ink is wet and we all know what liquid does to a sheet of normal paper, it bubbles. So make sure you have it printed onto quality thick paper or cardstock. Ask your bridal party or family to start things off. A big empty tree might seem confusing and no one likes to go first. Once a few people have had a go it will be easy for others to follow. Always have an ample supply of pens. If you want guests to sign as well as leave a print, make sure you have back up pens. The nibs can clog up with ink if people write over the prints when they aren't dry enough, so have spares. Display instructions. Let guests know the process or just that it's your guest book with a sign. There are loads of free signs to download on the I do it yourself website. More on that next post. Really it looks very beautiful. I like this. I got one and was very happy!